Berlin Marathon Training – Here We Go! Well, we’re here, y’all! Berlin Marathon training has begun and I for one, am excited. I shared my plan for this training cycle and my sub-4 goal in this post – check it out if you missed it. This is actually the first time I’ve done the full Hanson plan with the build up as written so I’m looking forward to it. This week was strange though – my legs felt tired on just about every run and over the weekend I was on my feet a bunch at a women’s conference so I had some really long days. Regardless, the runs got done and week one is in the books! Also I wanted to say that I am always in awe of our military and those who’ve made the ultimate sacrifice. As a military brat (my dad served, along with many other family members), I know that this weekend in particular can be hard for many folks. I am praying for those who are honoring those who’ve they’ve lost and am praying for those who are currently serving – and their family members. We are all better because of you. God bless, friends! Thursday: 3 easy rainy miles – I really don’t mind running in summer rain at all. As long as there isn’t lightening, I’m good to go! Saturday: Just over 5 miles with my ARRC ladies. Sunday: 3.25 miles and the second time I’ve ended a run at Whole Foods this week. I regret nothing. Doing anything fun to celebrate the long weekend? I’m sleeping in and relaxing! Woo-hoo! Hooray for the start of marathon training. Based on your awesome record of breaking PRs lately, I’m sure that you can get that sub-4 in Berlin. I’m so excited to follow you on your journey! I’m excited to follow your training for Berlin! The Hanson’s Method scares me, but it’s always interesting to see how others can make it work…I know I’d wind up injured if I attempted that kind of mileage LOL I agree with you about rain…I can handle the rain in warm weather,but anything under 70-degrees and I wimp out. Happy training!! Good luck with your training. This is so exciting. 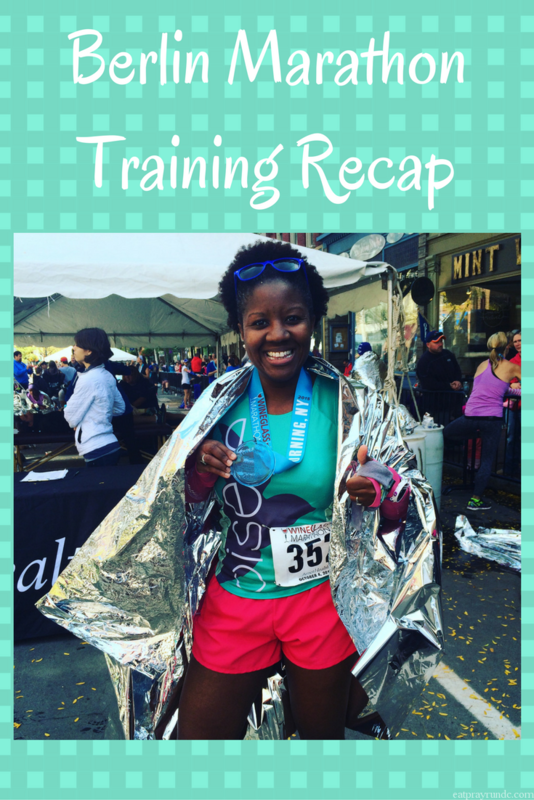 Yay for a great start in your Berlin Marathon training!!! Good luck with your training! I was not surprised to read about your goal for Berlin. As long as you stay healthy, you absolutely will be in shape to run that. I personally think your friend is right about the 3:45-3:50, but you can evaluate as it gets closer. It may seem crazy now, but it wasn’t too long ago that a 9:00 pace seemed crazy for a half! Great job on week 1 of training! Good luck with your training! Hansons definitely works, at least the half plan (I believe the full plan works too but haven’t personally done it to say so… but I have read so many good things). I like the idea of starting and ending runs at Whole Foods and do that a lot. They have clean bathrooms, water, and you can buy food after to refuel! Glad you have a run club to log some training runs with this summer. Good luck with training-I’m excited to follow along!! I used to run with a running shop in Newport News that started and ended at a Whole Foods–it’s never a bad idea! Never a bad idea is right. I’m ending more and more runs there these days! Good luck with marathon training! It sounds like you had a good week even though your legs were tired. I’m looking forward to starting training for a half marathon again this August. Right now, I’m rebuilding my base to get ready. Have a good week! Oh what is your half that you’ll be training for? Woo, how fun to start a new training plan! My IM Louisville plan starts this week so I’m a week behind you. It sounds like you had a great first week. How great is it at the beginning of a training cycle when you have so much excitement and energy and the time to do all the fun workouts?! Hope you enjoyed your day off! It’s SO nice at the beginning, lol. Especially because I know what’s coming…and it’s hard. Hahahaha! The start of a training cycle is always so exciting. I’m excited, but also scared and nervous, about starting my Chicago training next week. Eek! Kathryn @ Dancing to Running recently posted…Catching Up! Oooh! I’m so excited to talk Chicago with you this weekend!! Way to go on your training! Keep it up! My husband’s granddad was in the military as well. Also praying for them. All the best for your Boston marathon! Yay! I’m excited to follow your journey as you train for Berlin and your big goals! The first week of training is exciting. It feels like the first day of school with shiny new notebooks and sharpened pencils. Yes! That is exactly the same feeling that I have! Yay for the start of marathon training! And yay for those easy build-up weeks that make us think training will be easy, ha ha! Hahaha that is so so true, friend. LOL. so exciting! It is hard to believe marathon training season is here. I hope you have great success with Hansons again and Im looking forward to reading about your training. Mine for Chicago starts in a few weeks. Enjoy the easy few weeks that Hansons throws you in the beginning! Oh I am DEF enjoying these easy few weeks, hahaha! Yay for Chicago – I loved that race. And so it begins! The Whole Foods Run Club sounds fun! I’m hoping to get to do more club runs this summer with a less intense training schedule, we have so many to choose from in Philly! How exciting that you’re going to run the Berlin marathon… (I am German and would love to run a race back home sometime! ).